While scoring runs is always important in baseball and softball, having a pitcher who can control the game from the mound/circle is just as vital. Over the past week, Newington Joey Zawisza and Southington’s Kara Zazzaro were just that for their teams. After a 0-2 start that included an extra-inning loss to Windsor, the Newington baseball team was in need of a win entering Wednesday against Bristol Central and Zawisza proved more than up to the task. “Our pitching staff’s done a great job all year and Joey really put us on his back [Wednesday],” Indians head coach Ben Alaimo said. The senior struck out 11 hitters over the course of a seven-inning complete game. He also allowed just three hits and walked one in the 5-1 win. Newington has a solid 1-2-3 punch at the top of its rotation, but Zawisza’s performance was nothing that was unexpected from both his coach and his teammates. Zawisza was an all-conference pitcher his sophomore season before breaking his foot last year which cost him all but four games in the regular season and the postseason. The pitcher had little trouble in dealing with Bristol Central throughout the afternoon, he knew from the second inning on he was dialed in. But for Zawisza, it was more than just getting 11 strikeouts. And he can certainly do just that as the season continues. Like Zawisza said, the Indians have high expectations this season. The Southington softball team is in contention for the Class LL state title every season and this year is no different. The Blue Knights are already off to a 2-0 start with Zazzaro being a key reason why. The senior and Iona-bound pitcher dominated Bristol Eastern in the season opener last Monday, throwing a complete game, while giving up just two hits in a 6-0 victory. But perhaps what was most impressive was Zazzaro believed she should have been even better from the circle. Not one to only get things done with her pitches, Zazzaro also helped herself out with a RBI single in the third to put Southington up 2-0, showing how dangerous a player she is for opposing teams to deal with. Southington lost a considerable amount of talent from last year’s team that reached the LL title game, but having a player like Zazzaro to rely on, on a younger team, can make quite the difference. And if anything, the quick start to this season was a step in the right direction for Zazzaro. Until then, opposing teams know it’s going to be a long game when Zazzaro’s in. 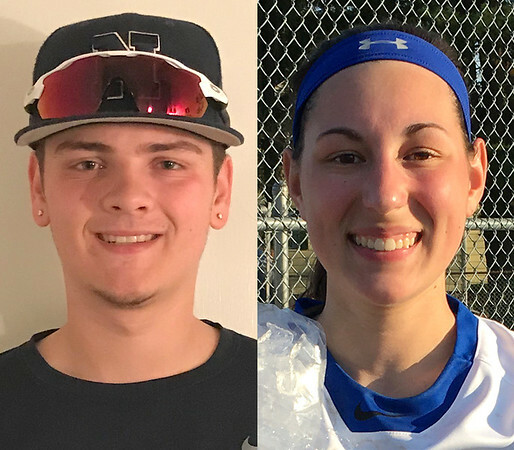 Posted in New Britain Herald, Athletes of the Week, Newington, Southington on Monday, 16 April 2018 18:49. Updated: Monday, 16 April 2018 21:12.